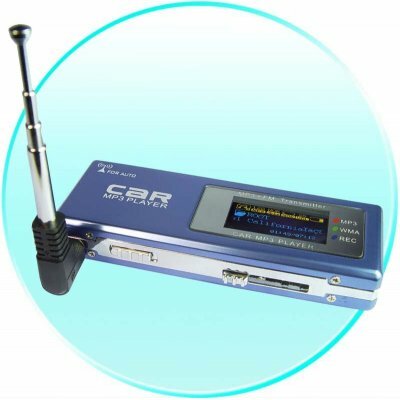 Successfully Added Car MP3 Player 2GB - Complete Car MP3 Music System to your Shopping Cart. 2GB MP3 Player Gadget perfect for use in a Car, with everything it needs to be a complete Car MP3 Musical Entertainment Package. It has a built in FM transmitters, letting you listen to your MP3 or WMA Music Files directly on your stereo, is packaged with a Car Cigarette Lighter Power Adapter for a direct recharge while driving, a 2 Color OLED Screen with ID3 Tags, and even 4 selectable screen savers. You will not be disappointed at the high sound quality available that the 2 x 10mW earphone output provides as well, and with 7 EQ settings you are sure to find the best sound for your music no matter your taste. This is a great item to buy or to sell, and is perfect way to whittle away those long hours in the car. Colours available- blue; silver: Please specify the colour(s) you require using the comments box in the online checkout process..